The guidelines that follow can be used anywhere, even while sitting in an airplane or car seat, or at a computer for prolonged periods of time. But first, some background information, which, in a way, is all you need to get started. Keep in mind however, that what’s most effective is to increase posturing flexibility. As that happens, your posture will more readily adapt to what is optimal for whatever situation you find yourself in. That includes the “straight and tall” shown above that projects confidence. Nonetheless, it’s critically important to not rigidly adhere to any posture, even what is known as good posture, as that will quicken the development of arthritic conditions, leading to fusion of the joints along your spine. A rigid nature in your disposition will also convey the demeanor of being uptight, which may not be the best way to build rapport with your friends. Every posture that stretches you beyond your norm can potentially be used to strengthen your core, coordinating more effective use of the spine’s resources – it’s segmental muscles, joints, along with the body’s regulation of itself through the central nervous system. Sure, for most everyone, the good-looking, ‘straight and tall’ positioning, as described below will, probably more often than not, be the most beneficial posture to explore. Can a so-called bad posture have any useful purpose in life? Yes. It’s only detrimental when it’s through unconscious habit. For stability, muscles and joints need to be counter-balanced by opposing forces in the body’s framework. For flexibility, a change in position can provide much relief for what was becoming overtaxed. Hold any position for some length of time, and you might notice an urge to move into its opposite position. Most importantly, it will not only be safer, but more effective if your approach, starting from a point of stillness, allows for only gentle, graceful, slow, incremental movement, without any hurried attempts, or impatience in what you hope to achieve. Take the time to feel whatever intrigues you, paying attention to your movements traversing through every cell. Otherwise, your posturing will be more disjointed, with limited coordination in accessing the segmental muscles. (1) Most people today are walking around with horrendous head forward posture. The ears are to be over the shoulders even while looking straight ahead. In checking the position of your head, you may be tempted to rotate your neck to see yourself in the mirror. As you do this, your ears will appear to be much further back than they actually are. This is cheating, of course, and it will be for naught, except for getting to see yourself in the mirror. To get a good idea of your upper spine alignment, have a friend take a picture of you from the side, or find something to rest your camera on, for shooting a video or a timed picture. To actually bring the head back over the shoulders, think of moving your chin closer to where the base of the skull meets the top of the neck in back. This may feel awkward, as this is not the sort of neck movement most people are used to. (c) side to side movement of the chin – rotating the neck. Yet, there is another movement – bringing the chin straight back without having to rotate the neck, or necessarily bringing the chin up or down. In doing so, you’ll be waking up segmental muscles along the cervical spine. (2) The ribcage is projecting out towards the space in front of you, though somewhat at a diagonal between a line that projects straight forward and a line towards your chin. (3) The ribcage is also lifting itself off of the abdomen – both in front and in back. (4) The naval area will usually need to be somewhat tucked in, for a more captivating feeling of the back’s connection to the front as one continuous gut, as it needs to be experienced. But not held to rigidly. (5) For the lower spine, we’ll focus on the position of the tailbone in relationship to the waistline or beltline – just above the iliac crest. These two landmarks define the lower and upper ends of the pelvis. When we move the tailbone from front to back, the iliac crest – that part of the pelvis where we put our hands on our “hips”, moves from back to front. And vice versa. Both movements define the rotation of the pelvis in the anterior to posterior plane. Explore the full range of this rotation, in both directions. The optimal standing straight and tall position will be somewhere in the center – between the two extremes of either direction. Within that middle ground(6) While standing, you want your knees to be almost straight but relaxed – not pulled completely straight. For most people, bringing all of the above 6 regions into a harmonizing interaction with each other can be quite challenging. Not a problem though, even if you have no access to Network Care, as there’s always a way to break it down into much smaller steps that can be handled easily. If your attention is being absorbed with one or two segments of the spine, you’re well on your way. Or just start with working on one region of the spine at a time. Then you can try coordinating any two regions together, then three, etc.. Every incremental step can only help in preventing the deterioration of spinal health, so prevalent in today’s modern age. 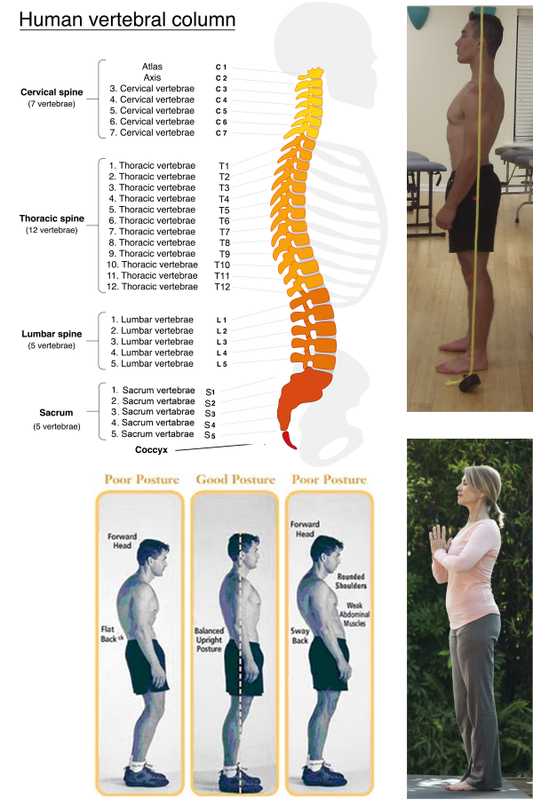 When you can feel your entire spine being able to expand and contract through all 31 spinal segments, that’s a good indicator that you’re in the zone of ideal posture for that moment, in which the so-called weight-bearing stress can actually feel quite energizing, as you connect to your segmental muscles, flexing them whenever they feel like being stretched or contracted. Tips for making this easier and more fun are on the main posture page, points 4 – 6, and 9 in particular.